In order to demonstrate the class-leading towing ability of the new Range Rover, Land Rover hitched up a newly-launched Airstream 684 Series 2 aluminium travel trailer to a Range Rover Autobiography and drove from Airstream’s European home in the English Lake District, to the top of the Atlas Mountains in Morocco. And back. The journey started at the factory where Airstream finishes its European-specification caravans in Tebay and went to Oukaïmeden, the highest ski resort in Africa. En route, it visited Land Rover’s factory in Solihull, Frank Gehry’s amazing aluminium Marques de Riscal building in the Spanish wine region of Rioja, the beach near Casablanca, the desert outside Chichaoua and the race track at Marrakesh, where Land Rover was based for the launch of the new model. 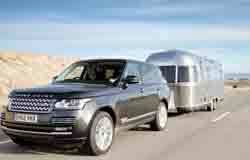 The new Range Rover coped imperiously with the challenge of towing the 2400 kg Airstream 3,676 miles in 11 days.